Lingo Horizon Translation Services is a friendly translation company with a customer-focused approach based in London, United Kingdom. We understand the needs of today’s world and the importance of language for businesses and individuals. We know that a clear message is the key to success in our diverse world. We are proud to provide innovative services designed to help our clients achieve their ambitions. Our aim at Lingo Horizon TS is to provide high-quality translation services for businesses and individuals in the UK and worldwide at the best price possible and based on the timeline required. We completely understand that using the wrong words can transform meaning, hinder your progress and damage your brand, therefore we take quality assurance procedures seriously. • Strict quality control procedures. • We work with experienced, fully trained and qualified translators. • Confidentiality and privacy procedures. - Free re-translation if you are not satisfied. Click here for our Testimonials page. Registered in England and Wales No. 08446470. Member of the Association of Translation Companies (ATC). 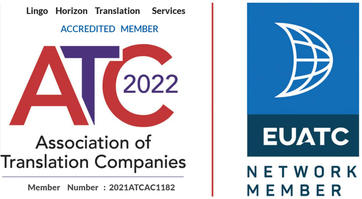 Network Member of European Union Association of Translation Companies (EUATC). Registered with ICO No. ZA124074 (Data Protection Authority).